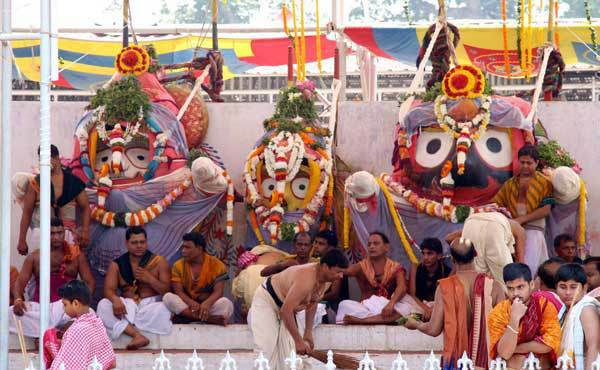 Every year on the last day of the month of Jyestha , the Jyestha Purnima Lord Jagannath along with Balabhadra and Devi Subhadra and Sudarshan Maharaj come out of the temple to take bath and darshan to all of his devotees. This is also known as Snana Purnima.The Snanabedi is decorated with traditional paintings. Toranas are put up and is decorated with different types of flowers. All the daily activities i.e nitis performed on Ratna Simshashana is done on the snana bedi today which include Mangala Alati, Madhyamha Dhoopa, mailam , Bhogalagi etc before his devotees . The deities bath with 108 pitchers of water brought from Suna kua(golden well) near Sitala temple of Jagannath temple. This well is also known as Patala ganga. 35 pitchers are for Lord Jagannath, 33 Pitchers are for Lord Balabhadra , 22 for Goddess Subhadra and 18 for sudarshan Maharaj. This year 2015, Nabakalebar is celebrated with extra 4 pitchers of water is for 4 darus which will be used for construction of new deities. The water is mixed with Chandan,Karpura, Kesar ,chuara in a 10:6 proportion. Yajna is performed to purify this water and kept in Bhog mandap the day before the Snana Purnima. According to Skanda Purana when Raja Indradyumna installed the wooden deities he arranged this bathing ceremony. This day considered to be the birthday of Lord jaganna th. It is held on the full-moon day of the month of Jyestha. 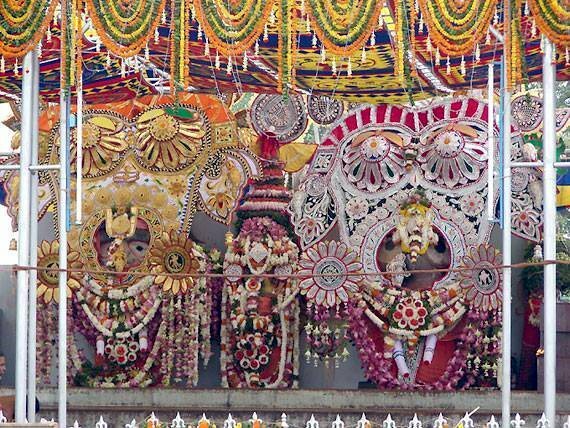 On the previous day of Snana Yatra the deites of Lord Jagannath, Balabhadra and Devi Subhadra along with the image of Sudarshana, Madanmohan are ceremonially brought out from the sanctum in a procession to the Snana-vedi. It is the Preliminary function of Annual Ratha Yatra (Car festival). The bathing festival takes place during the morning hours of the purnima tithi. The filled vessels are carried from Bhoga Mandap to the Snana Vedi by the Suaras/Daitapatis in a long single-line procession. This ritual is called ‘Jaladhibasa‘ (Jala – water, abhishek – bath). The bathing festival starts in the morning. On each vessel of water there is a coconut and a cloth called Karia.These are brought from Bhog mandap to Snana Bedi by Garabdu Sevaka by covering their mouth with clothes. After the pujas are performed by Pati Mahapatras, these sebakas starts pouring water on the deities . During this ritual , hymns are chanted. After the bath deities are dressed up like Ganesha.This is called Gajanana Besha.It is said those who see this Besha their shoul get purified and all the sins are washed off. Following snana Purnima the deities observe anabasara. Anabasar is observed for 15th day. On 14th day netrotsav is celebrated . After repaint and decoration the Lord appears before the devotees which is called Nabajauban. Then follow the great car festival or Rath Yatra. This year Nabakalebar is being celebrated . This year Nabakalebar , the Anasara will be for 45 days. Now after pious bathing of the Darus ,the construction of the deities will begin ins Koili Baikuntha. Just after 15 days , the constructed image will be brought inside the temple and the old deities will be cremated in Koili Baikuntha after the transfer of Brahma padartha. Within the next one month and half , the constructed images will be given the actual form of the Lords and on July 17 2015, the new images of the Lords are going to appear before the devotees. The car festival will be on 19th July. 3 am Mangalarpana & preparation for ‘Pahandi’ – The deities would be escorted in ceremonial Pahandi procession by Daita servitors to the Snana Mandap. 9.30 am to 11.30 am Jalabhisek Puja – The deities would be bathed with scented water brought in 108 pitchers. The water drawn from a special well called “Sunakua” inside the temple complex by the Garabadu servitors would be used. 12.15 pm Chhera Pahanra – Following the ritual, Gajapati king of Puri Dibyasingh Deb, would sweep the floors of the snan mandap with a golden broom. 12.30 pm and 3 pm Gaja Besha preparation – The deities would dressed in special attires looking like Lord Ganesha popularly called Haati Vesha. 6.30 pm to 9.30 pm ‘Hati Vesha’ Darshan – The Vesha would start from afternoon and continue till night. The devotees would be allowed to go to the bathing altar to offer prayers. Later, the deities would be shifted to anasar ghar (sick chamber) as they had fallen “sick” after taking bath. The Snana Purnima and the Gaja Besha would be the last ‘darshan’ of the Trinity as the idols would be buried inside Koili Baikuntha after ‘Brahma Parivartan’ of the new idols.